I've baked challah before and posted it on this blog. I told you then about the mythic challah of my adolescence. 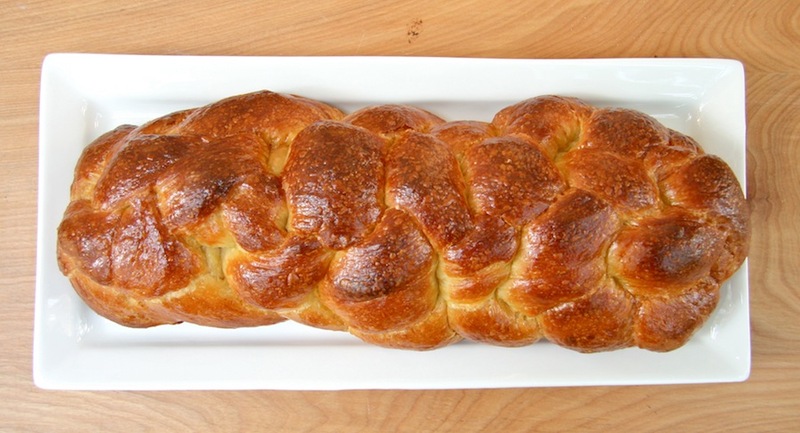 Here's the condensed version: when I arrived for my weekly babysitting job there was always a fresh-baked loaf of Sabbath challah, baked by the mother of the family. As much time as I spent with that family, helping with nearly every aspect of their lives, bread-baking is one task that I never assisted or even watched. And it never crossed my mind that I would ever (ever) bake bread myself. I have several recipes from that family, but not their challah recipe. It took me more than 30 years from those babysitting days, but eventually I did start to bake bread. And thanks to the Bread Baker's Apprentice, I baked that first challah (about 3 years ago). That challah was good bread, to be sure, but it wasn't the bread I've dreamed of ever since I left that family to go to college. As luck would have it (thank you, luck!) one of the friends I've made since beginning this baking-and-blogging thing is a marvelous baker from Vermont named Rebecca, who blogs at Grongar Blog (cool, right?) Rebecca shared her challah recipe with me, and I couldn't wait to try it. And then, once I made it, I couldn't wait to bake it again! Rebecca has posted her challah recipe today, in celebration of the Jewish New Year, and I'm joining the celebration by posting my challah loaves too. For the recipe, click over to Rebecca's post. She made the traditional-for-Rosh-Hashanah round shape, which symbolizes the cyclical nature of time, circling back on itself. To make the six-strand braid I used this tutorial. Easy Peasy!! This bread tastes exactly like the challah of my youth; you cannot imagine how happy that makes me! Thank you, Rebecca, for sharing your recipe with me, and now, with all of us. Happy New Year! I love your story, Nancy. And you made such a beautiful loaf! May there be many more gorgeous challah's, straight from your own oven. Love that story, Nancy! 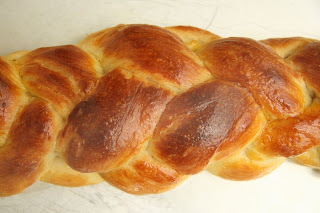 I, too, found this recipe a close match for the challah of my childhood......now, if only I could find my post..... ;-) The six-strand looks awesome!